Hermetic Code Tour of the Manitoba Legislative Building - a tour of decoding the famous symbols and architecture of the grandest provincial legislative building in Canada. Intrepid: Winnipeg’s James Bond - Winnipeg's Sir William Stephenson is best known by his wartime intelligence codename: Intrepid and is believed to be the inspiration for Ian Fleming's infamous character James bond. Architecture, Spies, and Hidden Codes Tour - Tour the city of trees, movie backdrop Chicago-style architecture and discover the secrets of Winnipeg's connection to James Bond and hidden hermetic codes. Winnipeg City Sightseeing Tour - Visit some of the most beautiful and interesting locations and attractions in Winnipeg. Beer and Food Tasting at Historic Fort Gibraltar - Try unique food paired with delicious local beers and ales at Fort Gibraltar, a historic Northwest Company fur trading post. 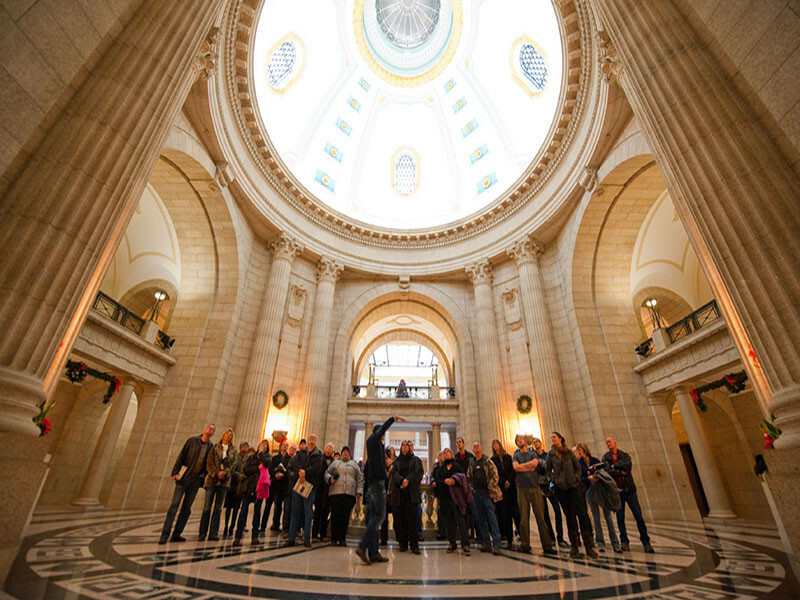 The Great Peg City Seek and Search - Teams complete tasks and earn points by photographing Winnipeg landmarks, collecting items and videotaping challenges. Amazing Place Winnipeg - Adapted from reality TV, Amazing Racers compete in challenges and questions at landmarks around Winnipeg. The Forks & French Quarter Day - Tour Winnipeg’s French Quarter (St. Boniface), the largest French speaking communiity in Western Canada. Shop Till You Drop - Visit unique boutiques, specialty stores and small galleries around Winnipeg to fulfill you're shopping cravings. We have been involved in the group tour and travel market for over 15 years and have the experience to plan and assist groups with the perfect tour itinerary best suited to fit your budget and interests.